Dales Dairies is a milk producer, processor and distribution business based at Grassington, Skipton, in the Yorkshire Dales. This runs alongside a working dairy farm. The business was started in 1938 by William Oversby, who ran the farm and started milk retailing to the local community. This continued to grow over the next 25 years and in 1963 he passed the reigns over to his son, John Oversby. He continued to see the business develop and in the early 1980s decided to sell milk out to other wholesalers within the Yorkshire area. A further 20 years of growth passed and in 2003, John decided to pass the business over to third generation son, David. At that point, the business changed its name to Town Head Farm Products Ltd and now has a customer base which includes local milkmen, schools, retail shops and wholesalers, through to large Public Sector Organisations. In January 2011, the company obtained the trading name of "Dales Dairies" and will be trading under this name in the future. 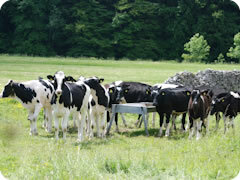 The local farming community plays a key part in our milk supply. Over 95% of our milk is sourced direct from local farms and comply with national farm assured quality standards. Our aim is to provide a first class service in terms of both quality and need. To achieve this we maintain strong, close customer relations and ensure customers and employees are treated with respect whilst improving the business in a changing environment.